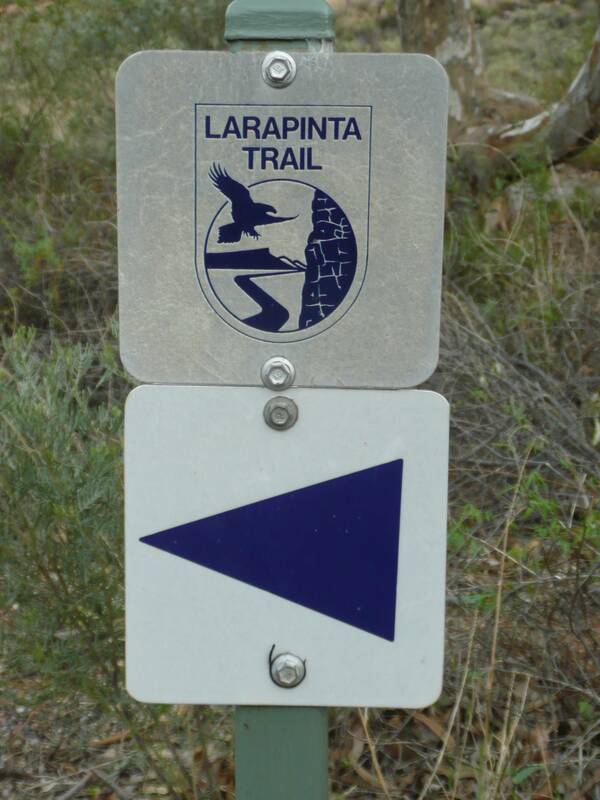 We established ourselves at the caravan park in Alice Springs and so began the 235kms Larapinta for 22 ARPA members. Lorraine’s training program and planning had been meticulous for the 15 – 31km days ahead starting at the Telegraph Station. Day 2 was the first long day (9.5 hrs) and a few blisters appeared. 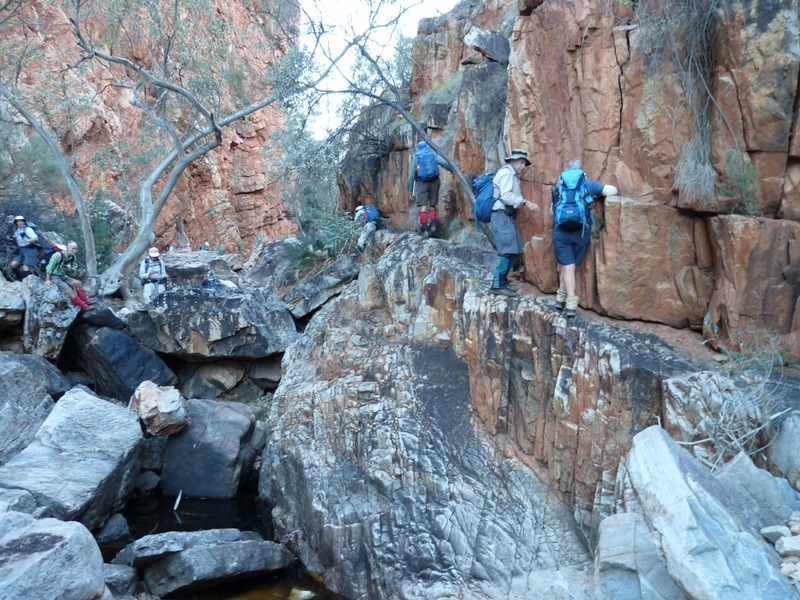 Day 3 was pleasant walking with light mist but the last 2 hrs were drizzle and, unfortunately, in the most spectacular red quartzite walls above Standley Chasm – the rain giving a gloss to the valley and dangerous slippery steps underfoot. In the meantime Alice Springs had had a deluge and the canvas tents had puddles inside, so our rest day was drying tents and bedding and enjoying a coffee in the Mall. 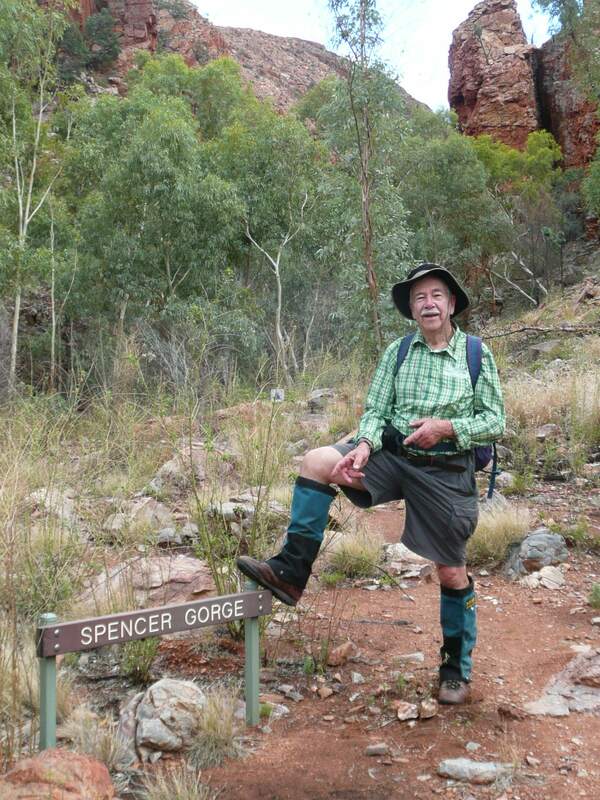 The next 3 days were the challenging remote camps and, to our credit, 15 walkers participated. We climbed Brinkley Bluff in cool windy conditions and arrived at Birthday Waterhole ahead of the Troop Carrier driven by our bus driver. He had our bedding and dinner. However once the sun went down it got colder very quickly so dinner was a hurried affair. 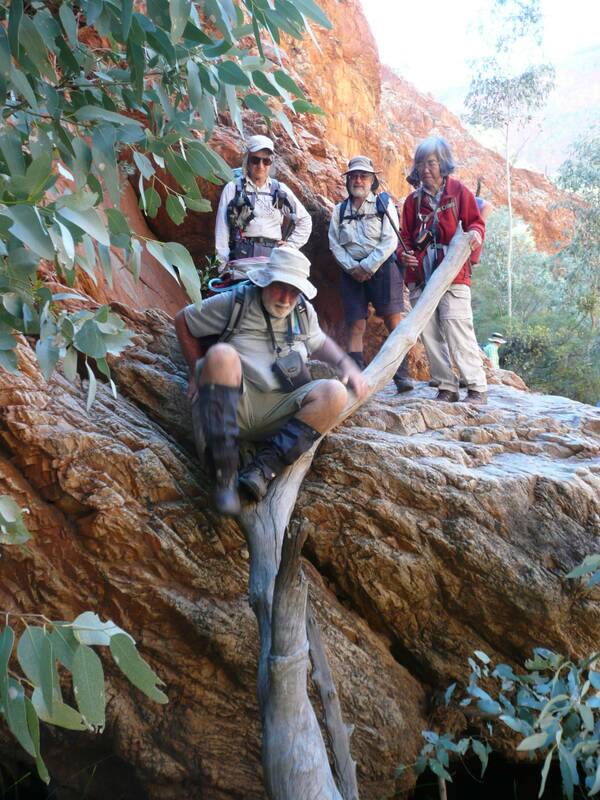 We climbed saddles and shale ridges and dropped down to a string of waterholes in Hugh Gorge. 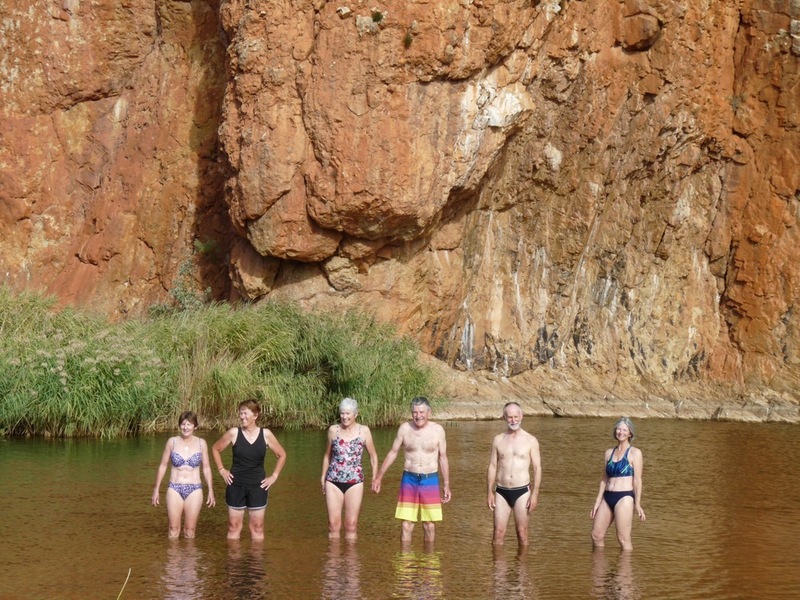 The 20 kms of plains between the Chewings and Heavitree Ranges was hard on the feet but our welcoming committee of rested members came to meet us and what a pleasing sight. 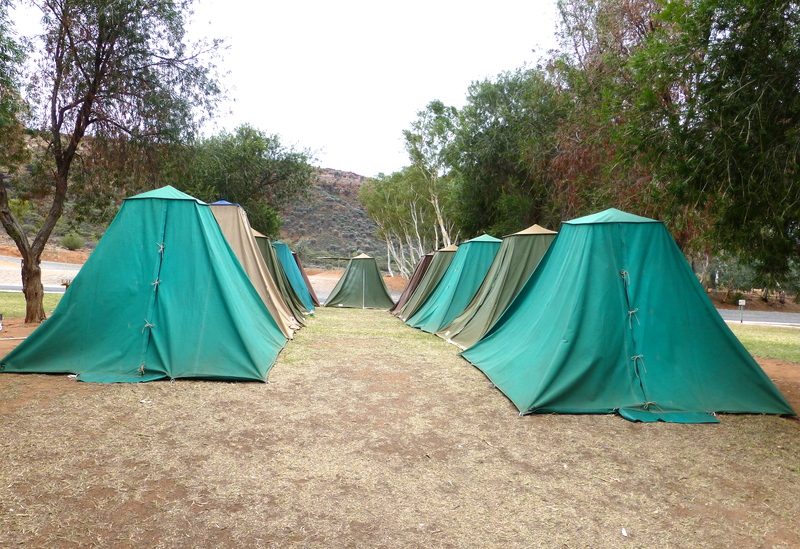 Tents and cabins at Glen Helen were our new lodgings and the rest day appreciated. 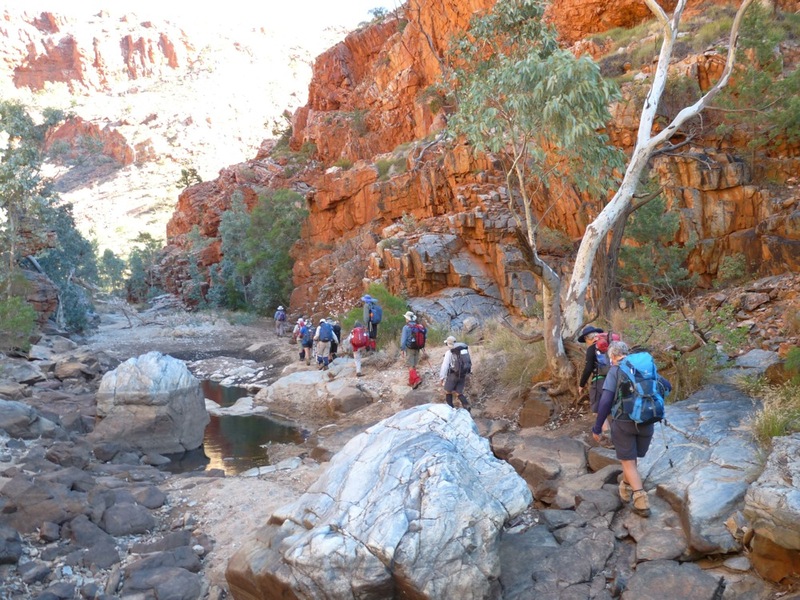 Temperatures were now in the high 20s and a long 11hr day of 30kms took us through the Ochre Pits, beautiful Inarlanga Pass to Ormiston Gorge. 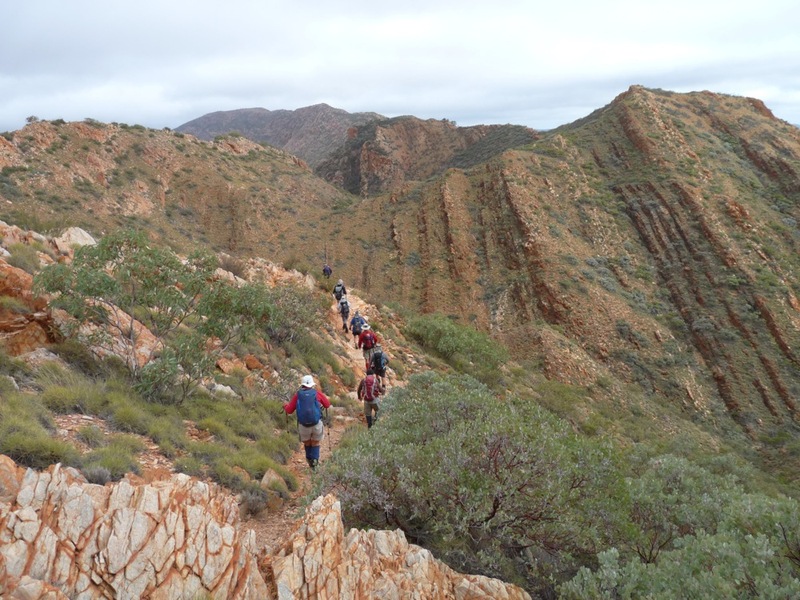 Then followed more gentle terrain of foothills and we could see our final destination of Mt Sonder looming slowly. The last day we explored Redbank Gorge then tackled Mt Sonder which didn’t look too inviting with its head in the clouds. This lifted just as we arrived on top but the temperature was a chilly 8 degrees and windy! We had walked through abundant areas of recent bushfires. 12 people walked all 12 days and we estimated we actually walked 270kms to include side trips and trails in and out. The first pair of boots began to disintegrate on Day 5. The only hick-up to our trip was the bus break-in at Cooper Pedy and items stolen. Our drivers/cooks did a marvellous job of looking after us often under very trying conditions. And a big thank you to Lorraine for all her excellent organisation.